Sophia (who will be 18 next month) called me the other day and asked if I’d like to come over and have breakfast with her. She’s staying with my parents right now (with the hopes of acquiring a JOB and moving into her own apartment), gaining her “independence” and sparing her brothers some of her teenage angst. The first week was… questionable. She spent most of her time there avoiding all responsibility and hanging out with friends. This second week, though, has gone better. She’s applied for some jobs, went to youth group, and is working on being more responsible. Baby steps.Very tiny, wobbly, and sometimes messy baby steps. It was a nice shift to have her be making me breakfast. I thought for sure there was some catch. Come for breakfast… andtakemeshopping or Come for breakfast… and borrow me some money or Come for breakfast… and — wait, money, shopping… what else is there? No catch though, and I checked myself for assuming there would be. Skeptical mom. She simply wanted to make me breakfast. I’m generally a picky breakfast eater. I don’t like too many carbs (at least not “bad” white ones), and if I do allow myself a treat (generally waffles), I bang up on the protien and fiber. 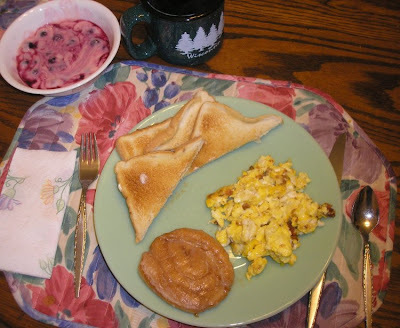 White bread, Honeybun, eggs with bacon and cheese, yogurt with blueberries and strawberries and coffee. I was hesitant to even touch the “white death” bread or honeybun because of my carb/breakfast issue. Do it for the kids, I told myself. Do it for Johnny!! And I did. And… it was good. Not the honeybun, gosh those things are like eating sugar-speckled chemically processed carpet fibers in the shape of a doughnut. But the eggs? Yummy. Toast — everyone can benefit from some nutritionally-void buttered white bread now and then. Coffee, good (surely made by my mother or father before they left), but whatever. Conversation was nice, the food was good. Finally. Finally a respite between the head-butting that has become so common over the past few years. Just as it was years ago, watching her take baby steps, make friends at the park or accomplish other rights-of-passage as a baby/toddler/pre-teen, it is also satisfying and gratifying to see her making those same steps into adulthood. Now if I could just get a picture of her that doesn’t look like it fell off of Myspace. My 18yo moved out too – to the BIG CITY! She made me a pot of tea when I went to visit. I’m glad to hear that! I know it’s been rough with her for awhile now. I hope she keeps making those baby steps and you guys get to keep having some stress-free time together. You an me both, Tina. Thank you!! What a treat! I am really glad that she went out of her way to make breakfast for you. It should be the start of something wonderful. I do hope she’ll get a job soon.